The National Research Council places Ohio State among the top 3-5 Plant Pathology doctoral programs in the U.S., based on regression and survey methods that generated ranges of rankings (2010, revised in 2011). 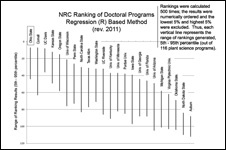 The NRC evaluated Plant Pathology among a group of 116 Plant Sciences doctoral programs. For our own comparison, we generated graphs of plant pathology programs that illustrates our top tier ranking (by our broad definition to include departments with plant pathology faculty).